Had to swing my Target for my wife, and of course, I am magnetically drawn to the cards. I see that the new Bowman are out - what the heck. Couple packs, right? I didn't get any big hits, but I did pull the die cut card you see to the right. What - you didn't know Bowman had rare, non-numbered die cut cards inserted in packs this year? Yeah, cuz they don't. 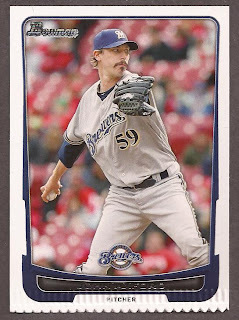 If you take a close look at the bottom of the John Axford there, you can see the cuts as well as the impressions in the card. Does the pattern look familiar? It's from sealing the pack. The card appears to have slipped a bit and was sitting too close to the edge of the pack as the end was heat sealed and stamp cut. And now, I have a 1/1 die cut 2012 Bowman. BOOM!!! !